My husband went to a NY Yankees game and left me home alone on a Friday night. I was going to get into some serious trouble and do some major damage. While the cat's away, the mouse will play! I was going to cook things that my husband won't eat and invite some girl friends over for a a ladies' night. Hmmmm, he hates feta cheese, mushrooms and most organ meats. Not a big list, but it still limits some great foods made with these ingredients. Since I knew my friends probably had zero interest in eating liver or sweetbreads (cows' glands), I thought I would make a ladies' night quiche. 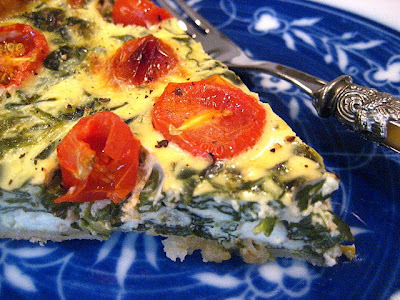 I made this delicious tart using fresh spinach, cherry tomatoes and FETA cheese! Start with rolling out your pastry to fit a 9" pie dish or tart pan with removable bottom. (you know how much I love my tart pans!). Blind bake the shell for 12 minutes at 375F degrees by covering with foil and placing pie weights in the center to hold the pastry in place. 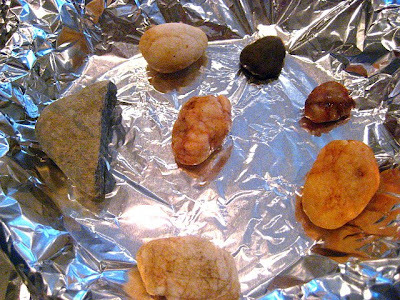 *I could not find my pie weights, so I used a few rocks from the garden. Very industrious of me! Meanwhile, make your custard by whisking 2 eggs with 1 yolk, the cream or half and half & the parmesan and feta cheese. 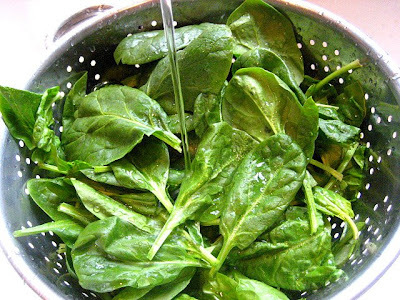 Steam your fresh spinach leaves in boiling water or in the microwave for about 3 minutes until wilted. Make sure you squeeze out all the water in the leaves, otherwise the tart will be soggy. Chop your spinach leaves on a cutting board and add to the custard mixture. Chop your garlic clove and mash with a little salt to form a paste. Add this to your spinach, cheese, egg custard in the bowl. Cut your cherry tomatoes in half and sprinkle with kosher salt and a tiny bit of olive oil to coat. Set aside. Remove foil from the tart shell and pour your custard into prebaked pie shell. Scatter cherry tomato halves on the top of the tart and grind with black pepper. Bake on a cookie sheet at 375F for about 45 minutes until puffed and golden. Remove tart ring by placing a can underneath and sliding off collar. I'm lucky because my hubs would love this too. The pie weights were hilarious. Only you would think of ROCKS! This looks really scrumptious and I know my husband would eat this too. I want one of those tall sided tart pans like yours. beautiful tart, beautiful presentation and beautiful photos - I'll take a big slice of this but dont tell the guys. I think Henry missed out on a great meal. I'd rather tuck into that tart than sit through a Yankees game. That is a beautiful tart that looks delicious! I would like to try this one sometime. I'll fly East for the next one! That quiche looks fantastic. 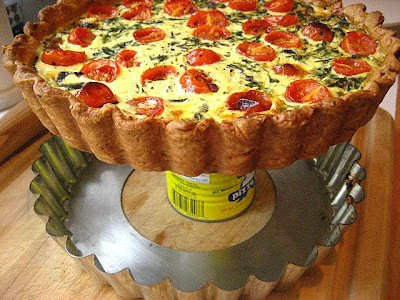 I don't have a quiche pan, just have always used a tart pan. Clearly, I need to remedy that situation. YUM! So glad you posted the Chippendale dancer, gave me a good chuckle this morning! I wish I could've been there... I need a girls night out! This looks really delicious. I want that tart pan, too! Looks delicious! I'll have to try it when my hubby is off playing poker later this month! My kind of dinner! This looks perfect for a Ladies Night in. I hope you served it with a big bottle of prosecco! WOW, is that your husband???? KIDDING! Tart sound delicious and look gorgeous Stacey! Wouldn't I love to have been a fly on the wall with the girls. Great tart! I love every ingredient that you used. Great photos, too. What a beautiful tart! I'd rather eat this than go to some football game. Or are the Yankees baseball? Soccer? Golf? Sigh. This looks great and it has all of my favorites! After a lovely meal like that, I'm sure your friends are going to want your husband to attend a few more Yankees games. 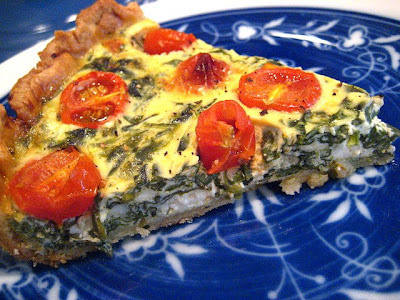 What a beautiful tart - I love feta cheese too! Thanks for sharing your can trick to get the tart out of the pan - I've always struggled with that! Ha, I love the rock shot! 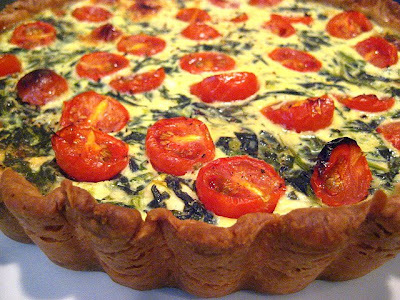 Beautiful quiche too, the tomatoes look magnificent. I love feta, cherry tomatoes and spinach! I would have come over to eat and not care where my hubby was! This looks amazingly delicious! 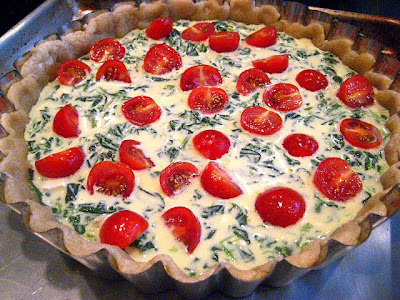 A gorgeous tart and that Feta and spinach thingy is delicious too! Tell your hubby, EVERYTHING's better with Feta! Wow, Stacey, this tart is gorgeous! Whenever Brent is traveling, I totally make the foods he hates. Last weekend, I searched all over the city to find the best mussels because I love them, but he will leave the house if I even mention the name. He hates them that much. Great choice for a ladies' night! Yum, this tart looks so good! I will try it this weekend! Check out my smoked salmon and spinach tart, I think you'll love it.